Welcome to another lengthy ramble and reminiscence! Part One covered Amelia Jane and the Famous Five and this part will be about the Adventure Series and Malory Towers. 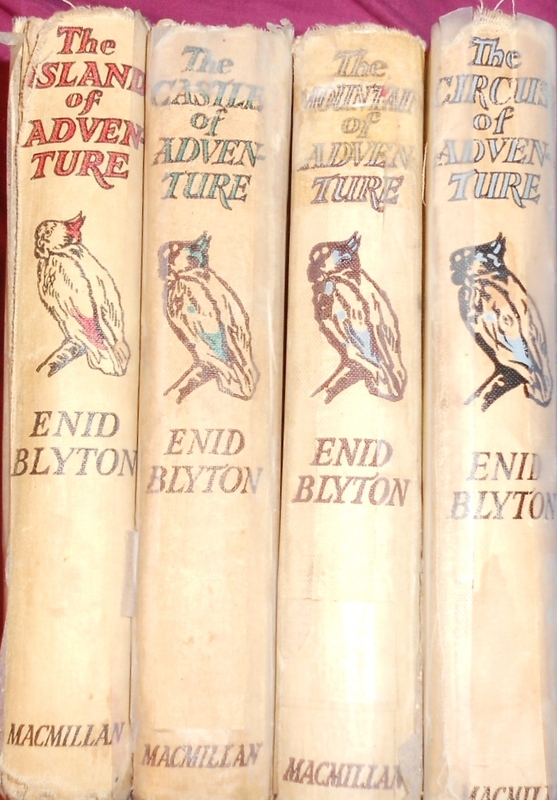 I think I started reading the Adventure Series not long after the Famous Five, and again had a mismatched set of books. Four were beautiful early editions with illustrated boards (and no dustjackets) and they had the same ‘smell of adventure’ (musty pages) as my Famous Fives did. I also had two Armada paperbacks and two 90s paperbacks. 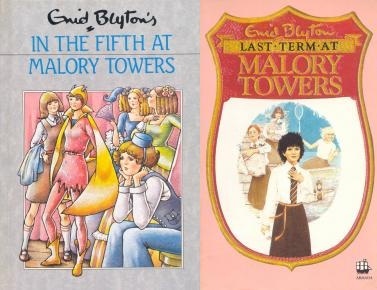 The Macmillan hardbacks were the first two: Island of Adventure and Castle of Adventure, as well as book 5: Mountain of Adventure and book 7: Circus of Adventure, all of which were handed down to me by my mum. Island, Castle, Sea and Circus with illustrated boards. You can tell they’ve been well read over the years! 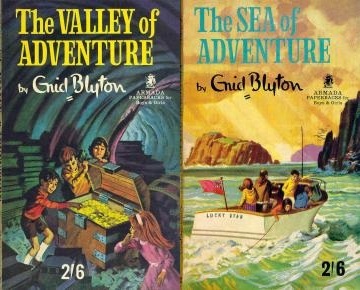 Valley of Adventure (3) and Sea of Adventure (6) were Armada paperbacks that used to belong to my mum (who coloured in several of Valley’s pictures in thick dark pen – though she denies it and is blaming her brother!). The Armada paperbacks, covers uncredited. 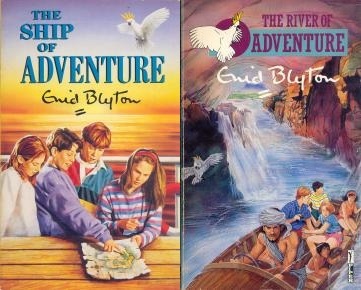 Ship of Adventure (6) and River of Adventure (8) were 90s paperbacks, by Piper. There’s a lengthy story as to why this is the copy of River that I had. I originally had an Armada paperback, with a plain paper cover replacing the missing original. My sister then for some unknown reason borrowed the Piper copy from the school library, and then proceeded to drop it down the toilet. (She came downstairs in tears wailing “I’ve done a baaaad thing, I’ve done a teeeeerible thing!” which I will never let her forget.) We then replaced the school copy and kept the wrinkly water damaged one. We were just going to tell the school we’d had a mishap with the book, but my sister decided to walk up to the head teacher in the corridor and announce the book’s fate to all and sundry. Piper paperbacks of “Ship” and “River”, covers by Peter Mannim. With this series my least favourite stories are the ones which 90s paperbacks. River is my absolute least favourite of the series, and Ship just isn’t quite as good as the other books for me. I have a very hard time organising the other six into an order of favourites – except for Circus which is the clear winner for me. Interestingly, while both the Macmillans and the Armadas have Stuart Tresilian’s wonderful illustrations, the Piper editions are not illustrated – which might be partly why those two are my least favourites especially compared to titles like Mountain which is considered the weakest title by several people I know. Like with my Famous Fives I liked reading the hardbacks best, what with their “smell of adventure!” I also liked the images on the fronts – almost like having a dustjacket in my opinion – as well as the illustrated spines. The spines of my hardbacks featuring Kiki the parrot. Trying to write about my Malory Towers books has given me such a headache. I’ve been racking my brains, I’ve even frozen my bottom off searching the loft looking for the box of old books… and I still can’t be sure which copies I had/read for two in the series. 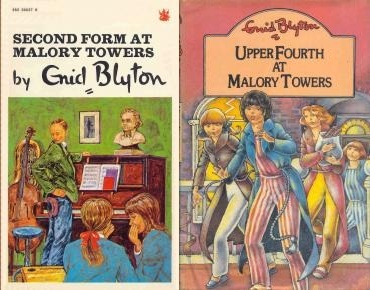 Second Form I know was the Dragon paperback – though I’d definitely read it in some form borrowed from the library before getting that version from an unknown source as I remember being desperate to read that thrilling cliff-top scene with Mary-Lou and Daphne again. I didn’t own Upper Fourth as a child, but the copy I remember best was an 80s Methuen hardback with dustjacket which I borrowed a few times hundreds of times from the local library, and I later bought the same version on eBay (accidentally, I think as I would have been after an earlier book) which once belonged to a Newcastle public library. Whether or not I owned another version between the library borrowings and the Newcastle copy, I have no idea. In the Fifth was a 90s Dean hardback, which was also borrowed multiple times from the library – and eventually I bought it from the sale rack for about 20p. Last Term, a 90s Armada paperback, was presumably bought for me by my parents. “In the Fifth” Dean hardback, cover by Hilda Offen, and “Last Term” Armada paperback cover by Gwyneth Jones. Not a very exciting set of stories, but for the life of me I couldn’t tell you where or when I got most of those books, just like I cannot identify which copy I had of First Term or Third Form. There are 15 versions to choose from in the Cave of Books… none of them jump out at me like the others did. I’ve considered the possibility that I never owned them, and so don’t remember those two as I only read them a few times having borrowed them from the library, but I was so sure I’d had them all. The fact I can find the other four in the loft somewhat lends credence to that theory though. Maybe I’m confusing myself with completing the collection in hardback. Favourites wise, I’d say I like all six about equally, so my preference really wasn’t influenced by format. All my copies had illustrations by Jenny Chapple, and I remember quite liking them – though my memory has failed me again and I couldn’t tell you what her style was like… though I’ve now made another trip into my freezing loft to find out. They’re quite good – perhaps a little wobbly-lined but they’re fairly timeless and simple. Perhaps the uniformity of illustrator was more important than the disparity in format and covers. Actually, when I started buying the Methuen hardbacks I was slightly disappointed by Stanley Lloyd’s illustrations as their shading is a bit strong so fine detail is lost somewhat, plus the characters looked different to what I was used to. I’m going to stop before my memory completely gives out now! Do you recognise any of these editions, if so what do they mean to you? This entry was posted in Personal Experiences, Purchases and tagged Armada, Dragon, Editions, Gwyneth Jones, Hilda Offen, Jenny Chapple, Macmillan, Malory Towers, Methuen, My Childhood Books, Paul Wright, Stanley Lloyd, Stuart Tresilian, The Adventure Series. Bookmark the permalink.